People visit the food bank for all sorts of reasons: job loss, debt and eviction, benefit issues, refugee an asylum seeker issues, homelessness, domestic violence, substance misuse, bereavement, and physical and mental health issues. Many of our clients only need short term practical support from the food bank, to help them through a difficult financial period. However, some of our clients need additional support to get them back on track, and that’s where our Advocacy, Guidance and Support work comes in. in 2018, Cath Williams our Development Worker delivered 232 hours of one to one client support and gave clients the support below. What sort of additional help do we provide? We help clients in lots of different ways. Our Advocacy, Guidance and Support service offers clients a safe space, a listening ear, and emotional support. We work with clients to understand the challenges they’re facing, and help them access the support they need. Some of our clients just need information and signposting; a quick chat and some of our guidance leaflets are enough to point them in the right direction. Some clients need more support from us: help with budgeting, understanding and completing documents and applications, someone to advocate on their behalf with other organisations. Some of our clients are moving into new properties that are completely bare and unfurnished; we help them access basic furniture to make their property to feel more like a home. This can mean the difference between someone staying in a property or returning to a life on the streets. 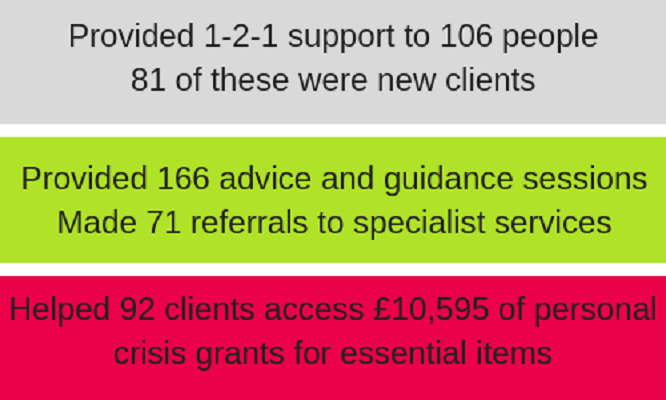 Over the past 12 months, we have also been helping lots of clients struggling with their Universal Credit claims. In many cases, this is because clients are unable to manage their online claim, but clients also struggle with the initial five week wait for their first payment, and managing their budget when they don’t know how much money they’ll receive month to month. Some of our clients need specialist support that we can’t provide ourselves. We refer these clients to other specialist agencies who can help them, and we continue to work with the client in the background as well.